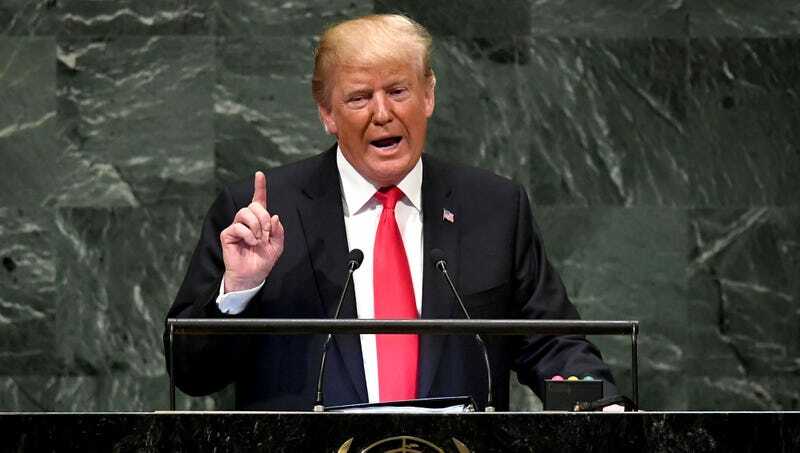 NEW YORK—Shaking their heads in disbelief at their past views, everyone present at the United Nations summit watching President Donald Trump deliver a speech Tuesday reportedly couldn’t believe they used to consider the United States a superpower. “I mean, wow, we would base most of our decisions on what the U.S. was going to do—seriously, what the hell were we thinking?” said Prime Minister of Portugal António Costa, echoing the sentiments of dozens of other world leaders attending the General Assembly session who wondered how they had ever convinced themselves that they should care what America thinks. “We really used to see the U.S. as one of, if not the dominant force in the world, but that seems like forever ago. There are probably 20 or 30 countries whose plans I’d pay attention to before I even thought to consider how America would react. Seriously, imagine being concerned over how your diplomatic relations with Donald Trump are going—it feels totally beside the point, right? Although, jeez, if I’m being honest, maybe ever considering America to be a global superpower in the first place was misguided.” At press time, Trump casually threatening to unilaterally bomb multiple other countries with little justification reminded everyone at the U.N. that this was the reason everyone had to take America seriously.